Sprinkle the gelatin over 2 tablespoons of cold water in a small saucepan. Soak until softened (about 5 minutes). Add 2 tablespoons of ice wine to the gelatin mixture and warm the mixture over low heat, just until the gelatin melts and the mixture is completely smooth. Remove from the heat and transfer to a metal bowl. Add the remaining wine. Cool to room temperature, then ladle into 4 to 6 small glasses. Chill until set, about 2 hours. Alternatively, pour the mixture in a shallow square pan. Chill until set, then cut into 1" cubes. About 25 minutes before serving, rinse the grapes with cold water and spread them on a parchment-lined baking sheet without touching one another. Place in the freezer until serving time. 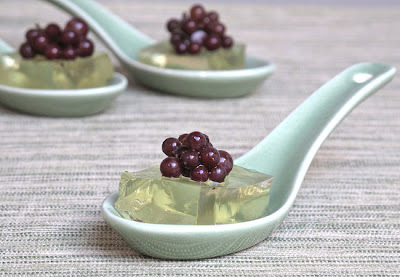 Arrange the ice wine shots on a, and surround with the partially frozen grapes.